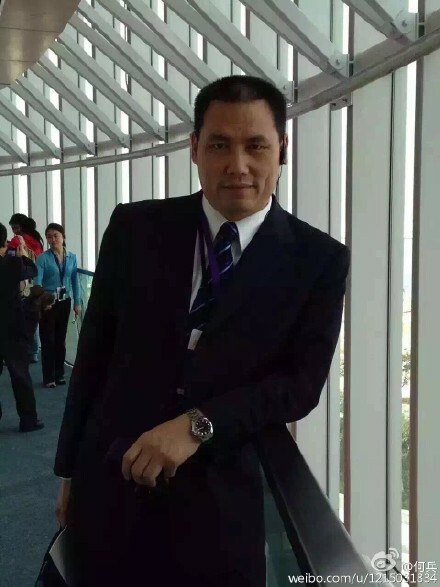 Curse of "Zhiqiang": This photo of Chinese rights lawyer Pu Zhiqiang was one of the most rapidly censored posts on the Sina Weibo microblogging platform last month. Posted on February 28 with the comment “Fortunately, my name isn’t Zhiqiang,” it was shared 382 times within 30 minutes before being deleted. The comment refers to the “bad luck” of both Pu Zhiqiang, who received a three-year suspended sentence in December over his Weibo posts, and real-estate tycoon Ren Zhiqiang, whose Weibo account with 37 million followers was deleted in late February after he criticized President Xi Jinping’s speech on media controls. Credit: Weiboscope. A drawing by political cartoonist Kuang Biao that depicts real-estate tycoon and Communist Party member Ren Zhiqiang as the victim of Mao-style political denunciation. After Kuang published the image of Ren—whose hugely popular Sina Weibo microblog account was deleted for criticizing Xi Jinping’s speech—the artist’s own Wehat account was then also shuttered. Credit: China Digital Times. This article was also published in the Diplomat on March 8, 2016. In a high-profile speech last month, Chinese president and Communist Party chief Xi Jinping elucidated his vision for forthcoming censorship and propaganda work. He declared that the media should fully identify with the party’s agenda—or as he put it, be “surnamed ‘Party’”—and that this standard should apply to the full spectrum of media content, from party-run outlets and commercial newspapers to advertising and entertainment. At first glance, Xi’s forceful approach may give the impression of a bold leader asserting full control over his country’s information landscape. But behind the new media policy lies a risky gamble that could do more harm than good to public confidence in the party and its messaging. At the root of the policy—a heavy-handed one even by Communist Party standards—is an incongruous combination of regime confidence and insecurity. On the one hand, Xi seems assured of the capacity of the censorship and propaganda apparatus to increase control, especially given past “successes” since he rose to power. For example, the Great Firewall has become more resistant to circumvention, critical political discussion on microblogs has been muzzled and a state-funded digital news outlet, the Paper, is gaining influence as commercial media and investigative reporting decline. On the other hand, deep anxiety in the regime appears to be driving these greater controls. Officials are eager to suppress bad news about the economy, worried over public mistrust in state media, and engaged in internal battles linked to a fierce anticorruption campaign and leadership appointments due next year. All of these factors have raised concerns that even the highly restrictive status quo is no longer sufficient to preserve the party’s—and Xi’s own—political power. But in addition to its negative effect on free expression, Xi’s policy may actually exacerbate the problems he is trying to resolve. A 2015 Freedom House report warned that the party’s repressive tactics could become self-defeating, and several incidents since Xi’s speech hint at how this might play out in the media sphere. First, increased censorship on economic matters, especially when its footprints are clearly evident, can spook foreign and domestic investors, spurring more capital flight. At around the time of Xi’s speech, the central bank unexpectedly removed sensitive data used to assess capital flows from a regular financial report, and international media noted other efforts to curb publication of information that might portray the economy in a negative light. Less than two weeks later, the credit rating agency Moody’s downgraded China’s outlook from stable to negative, citing factors including a lack of “credible” reforms. Meanwhile, a day after the Chinese internet portal Sina deleted the popular microblog account of real-estate tycoon Ren Zhiqiang—under government orders—due to his criticism of the new media policy, shares of the company’s NASDAQ-listed stock dropped more than 5 percent. Second, Ren is not alone in questioning the notion that the media should prioritize the party’s interests over the people’s. As David Kelly of the China Policy consultancy told the Financial Times, Ren represents a “trend in society which is totally fed up” with Xi’s divisive and repressive leadership style, and is not afraid to speak out. Punishing Ren, who had 37 million microblog followers, may intimidate some, but it will also stir resentment among the many who agree with him. On March 4, several party cadres published an open letter online that went so far as to call for Xi’s resignation, citing his handling of the media and encouragement of a “personality cult,” among other reasons. Just days later, the English website of Caixin, run by one of China’s most prominent journalists, took the rare step of publicizing the censorship of an article. The deleted piece had quoted a member of a government advisory body who called for greater freedom to offer honest opinions about party leaders. Third, it is unclear that making state media more propagandistic and encouraging them to innovate on dissemination (but not on substance) will necessarily increase public trust in their messages. If one considers the past rise of popular microbloggers, or “Big Vs,” and the growth of commercial papers, it was candid expression and solid investigative reporting that built trust and drew in dedicated readers. Beijing has been attempting to expand the global reach of state media like China Central Television and Xinhua News Agency. By making party dominance over the outlets so explicit, Xi risks undermining any credibility they may have acquired among international audiences. These dynamics illustrate the dangers of Xi’s approach. He is betting that those who are unaware of, indifferent to, or likely to be swayed by his heavy-handed media policy will decisively outnumber those who are dissatisfied or even motivated to work against it, and against the party’s political power in general. We do not yet know if this gamble will succeed. But we do know that in the meantime, media consumers inside and outside China will be paying the price of more limited information about the critical economic, social, and environmental challenges facing the country. Sarah Cook is a Senior Research Analyst for East Asia at Freedom House and director of the China Media Bulletin. On February 19, Chinese Communist Party (CCP) leader and state president Xi Jinping made a series of rare and high-profile visits to three flagship state-run news outlets: the party mouthpiece People’s Daily, the official Xinhua news agency, and the national broadcaster China Central Television. (Xi held a video conference with the CCTV America branch in Washington.) The president was greeted with applause, a banner pledging loyalty to the party, and a fawning poem by Xinhua editor Pu Liye that was widely circulated online, drawing netizen ridicule. After the visits, Xi gave a speech on media policy at a symposium attended by nearly 200 officials from Beijing and across the media sector. Explicitly putting the party first: Although China’s media have long been under the firm hand of the CCP, even flagship news outlets have attempted to professionalize over the past two decades, balancing the twin priorities of adhering to the party line and engaging in at least some meaningful journalism. This has been the case both domestically and as part of an international push to gain credibility and audiences abroad. In widely quoted segments of his speech, however, Xi emphasizes that “the media should be surnamed party”—meaning all outlets should think of themselves as CCP messengers—and that “raising high the banner” of socialism with Chinese characteristics must take precedence. David Bandurski of Hong Kong University’s China Media Project termed Xi’s approach Control 3.0, noting its more heavy-handed nature compared with the emphasis on public opinion “guidance” and “channeling” under his predecessors Hu Jintao and Jiang Zemin. Chinese media jumped into action almost immediately after Xi’s speech. Within days, the Hunan Daily reportedly held a study session focused on the latest wisdom from the CCP leader. On February 25, the People’s Daily reported that the Central Propaganda Department had issued a notice ordering cadres throughout the media-control bureaucracy to study and implement the “spirit” of Xi’s speech. Meanwhile, the first case of journalists being disciplined for not stepping in line was quickly reported, as editors of the Guangzhou-based Southern Metropolis News were punished for a front page that some interpreted as backhanded criticism of Xi’s policy. On February 20, under a headline referring to the speech, the paper’s Shenzhen edition ran a photo and wording for a second story that, if read vertically with the other headline, would say “Media following the surname of the party have their souls returned to the sea.” The deputy chief editor, Wang Haijun, was given a “serious demerit,” and Liu Yuxia, one of the front-page editors, was fired. Only three days after President Xi Jinping visited key state news outlets and announced a media policy that would strengthen adherence to the party line, one of the most popular commentators on the Sina Weibo microblogging platform came under fire for criticizing Xi’s approach. Ren’s case, though prominent, does not appear to be isolated. On February 26, the CAC ordered the closure of the social-media accounts of actor Sun Haiying, scholar Rong Jian, and urban affairs expert Luo Yameng, asserting that “there are some internet celebrities who ignore their social responsibilities, abuse their influence, and constantly publish information that is against the law, which disturbs the social order, and damages the country’s well-being and reputation.” According to the CAC notice, the accounts were among 580 closed since February 8. The crackdown is reminiscent of events in August 2013, when Xi gave a speech urging propaganda cadres to regain the upper hand in guiding online discourse. Four days after the speech, American businessman and popular microblogger Charles Xue was detained on apparently trumped-up charges, setting off a series of measures targeting Big Vs that significantly reduced political commentary and news sharing on Sina Weibo. Given Ren’s popularity and close official ties, his silencing provoked much discussion, disappointment, and shock among China’s netizens and entrepreneurs. Official bodies responded with efforts to restrict such conversations online. Some websites posting the CAC announcement reportedly deactivated their comment section, and Baidu banned users from establishing a Tieba discussion forum about Ren. After political cartoonist Kuang Biao published a drawing portraying Ren as the victim of Mao-style political denunciation, he reported that his own WeChat account was deleted. Recent developments in cases involving Chinese and Tibetan activists highlight the geographic diversity of recent restrictions on free expression and the variety of punishments being handed down. They also indicate intensified efforts to prosecute low-profile activists for social-media posts relaying information or images that the CCP deems politically sensitive. On February 25, Zhang Kai, a lawyer who had represented persecuted Christians and other victims of government repression, appeared on state-controlled Wenzhou TV in Zhejiang Province to “confess” to a range of alleged crimes. Zhang looked thin and haggard after six months in detention. His statements were part of a 10-minute segment on the evening news in which Zhang was portrayed as the mastermind of protests by local Christians against an official campaign of cross demolitions. Zhang expressed regret over his activism and admitted to “breaking the country’s laws, disrupting social order, endangering state security.” He added that there were “foreign forces” involved and warned other lawyers not to “collude” with or accept funding from such entities. Many observers felt he was being forced to read from a script provided by the authorities. Zhang is the latest rights activist to be forced to make a televised confession prior to being tried in court; the deputy head of the government-affiliated All China’s Lawyers Association called for an end to the practice. Separately over the past several weeks, three-year prison sentences were handed down for Tibetan blogger Druklo in Qinghai Province and activist Jiang Lijun in Liaoning due to their online writings, and Tibetan monk Gomar Choepel was given a two-year sentence in Qinghai for sharing a photo of the Dalai Lama via social media. Another Tibetan man, serving a 13-year sentence imposed in 2014 for refusing to fly the Chinese flag in his village, reportedly died in prison. Meanwhile, authorities in Jilin Province issued a new indictment for citizen journalist Wang Jing in apparent retaliation for reports about the activities of petitioners that she had posted on social media and the Sichuan-based rights website Tianwang. In recent weeks, Chinese government regulators have announced or implemented a series of new restrictions on broadcast and online television programming. The orders mark a departure from previous practice and will likely cost various players in the industry millions of dollars. Hong Kong, Taiwan film award shows banned: On February 20, national state broadcaster China Central Television announced that it would not be airing the Hong Kong Film Awards ceremony scheduled for April 3, although it has carried the program annually since 1991. Internet portal Tencent similarly announced that it was suspending its online broadcast despite having already paid a $515,000 deposit for the streaming rights. News outlets and industry insiders reported that the order had come from the highest echelons of the censorship apparatus and was triggered by the nomination of Ten Years for best picture. The low-budget independent film, which was an unexpected box-office hit in Hong Kong, includes five short vignettes depicting a dystopian future for the territory under Beijing’s tightening political, security, and linguistic control. Derek Tung Sing Yee, chairman of the film association’s board of directors, told the Ming Pao Daily that the association stands to lose out on an online broadcast fee of HK$5 million (US$643,000). Taiwan’s Golden Horse film awards, to take place at the end of the year, will also not be aired in China as previously planned. Ironically, the move to censor the ceremonies seems to lend more credence to the fears of growing repression depicted in Ten Years. Oscars live broadcast canceled: On February 28, the online broadcast of the 88th Academy Awards—the U.S. film awards ceremony also known as the Oscars—was moved from one Chinese host to another at the last minute. The commercial streaming site iQiyi.com, mostly owned by search-engine giant Baidu, had heavily promoted its plans to air a live bilingual broadcast of the ceremony. But on the morning of February 29 Beijing time, viewers found no evidence of the program on its site. Instead, the broadcast had been switched to 1905.com, a website of the state-run national broadcaster China Central Television’s movie channel. Moreover, the live format was replaced with a series of short segments posted with a delay. Douyu TV, another online firm that had planned to stream the program, did not do so either. iQiyi declined to comment on the reasons for the change, but observers speculated that it was due to the nomination of Winter on Fire: Ukraine’s Fight for Freedom, a documentary film about protests that ousted Ukrainian president Viktor Yanukovych in 2014. Users reported that searches for the film’s title on Sina Weibo had been blocked. Chinese refugees under threat in Thailand: The case of Hong Kong bookseller Gui Minhai, who was abducted from Thailand in October 2015 and detained in mainland China, appears to be part of a growing pattern. In early February, Chinese journalist Li Xin disappeared from Thailand near the Laos border, then called his wife from China later and—like other suspected abductees—claimed that he had returned voluntarily to assist in an investigation. Li, a former journalist at the Southern Metropolis Daily, fled China in October after Chinese security agents tried to pressure him into spying on human rights activists. He had initially made his way to India but was unable to gain asylum there. Other Chinese dissidents in Thailand report more subtle forms of intimidation. Liu Xuehong, a human rights activist and UN-designated refugee awaiting resettlement, told Reuters that suspicious men in cars have followed her around Bangkok, and that she received a threatening phone call from a Chinese official. Song Zhiyu, a Falun Gong refugee, said that under Thailand’s military regime, more than 29 fellow adherents of the spiritual practice had been detained on immigration charges and feared deportation back to China. Thailand was rated Not Free in the 2016 edition of Freedom House’s Freedom in the World report. Tibetan photographs censored at Bangladesh exhibit: The Dhaka Art Summit, one of South Asia’s most prestigious art shows, took place in the Bangladeshi capital from February 5 to 8. On display was a series of photographs titled “Last Words,” which featured letters written by Tibetans who had self-immolated to protest oppressive Chinese rule. The images were submitted by Indian filmmaker Rito Sarin and Tibetan exile Tenzing Sonam. But after China’s ambassador to Bangladesh visited the exhibit and “exploded” at the sight of the photos, he sent the summit’s organizers an e-mail demanding that the pieces be removed. In consultation with the owners, however, they decided instead to cover the pieces with white paper, limiting visitors’ ability to view the letters but providing an iconic image of the globalization of Chinese Communist Party censorship. In 2009, Bangladeshi authorities had shuttered another photography exhibit on Tibet at the request of Chinese diplomats. U.S. restricts sales to ZTE for violating Iran sanctions: On March 7, the U.S. Department of Commerce announced that American companies will now need special permission to sell parts to ZTE, a smartphone maker and one of China’s largest technology firms, because it was found to have violated sanctions by selling American-made goods to Iran. The department said that ZTE had planned to “illicitly re-export controlled items to Iran in violation of U.S export laws.” It also cited two internal company documents to back up claims that the firm was deliberately violating sanctions, including those on countries like North Korea, Syria, and Cuba. The new export controls are likely to make business more difficult for ZTE, whose phones use certain components made by U.S. companies. Full text and further implementation of Xi Jinping speech: Watch for the publication of leaked or approved versions of Xi’s February 19 speech. These will shed further light on the motivations behind and contours of his media policy. As implementation continues, watch for censorship of any backlash on Sina Weibo and Tencent’s WeChat, dismissals of journalists for noncompliance, and more flashy propaganda attempts like a recent animated video depicting “Xi Dada” vanquishing corrupt officials. More pushback on media controls: As important as Xi’s speech will be for China’s media landscape in the near future, the pushback against it—from journalists, netizens, and even party cadres—has been just as notable. Watch for more instances of high-profile criticism and active resistance from within the party-state apparatus and the media industry. Enforcement of new online publication rules: In February, government regulators issued new rules that could severely restrict foreign firms’ ability to publish (or even aggregate) a wide range of content online, including text, maps, games, animation, and videos. There has been much confusion and anxiety regarding what the regulations cover and how they will be applied. As the “Online Publishing Service Management Rules” come into effect on March 10, watch for how—and against whom—they are enforced.